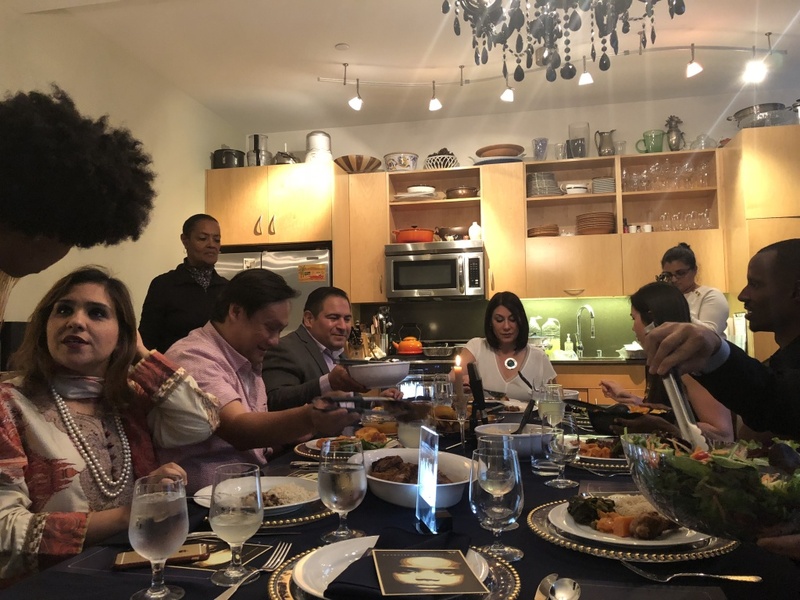 A new approach to improving race relations in Los Angeles: gathering strangers around the dinner table to talk it out. It's an initative called embRACE L.A. from City Council President Herb Wesson and Councilmember Mitch O’Farrell. Anthony is a trained facilitator from Community Coalition, a nonprofit partner of embRACE L.A. 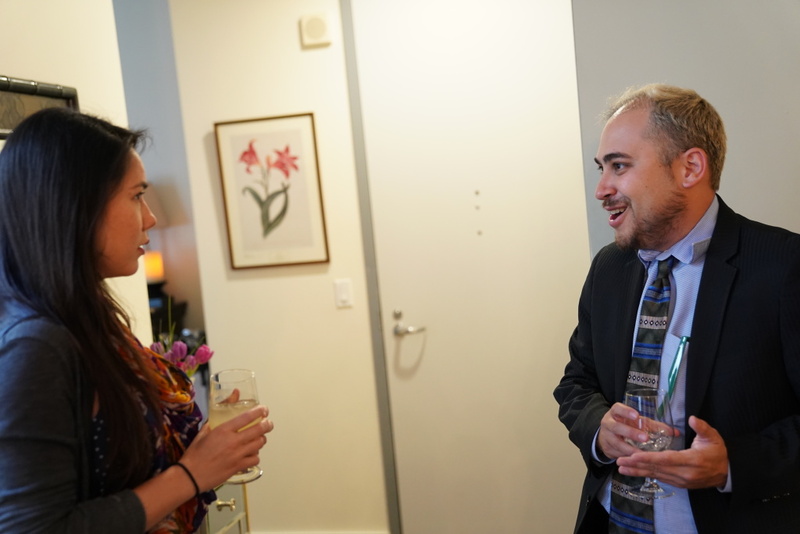 He guided the conversation in the downtown L.A. home of Veronica Perez, who volunteered to open her home for the Tuesday, April 17 event. 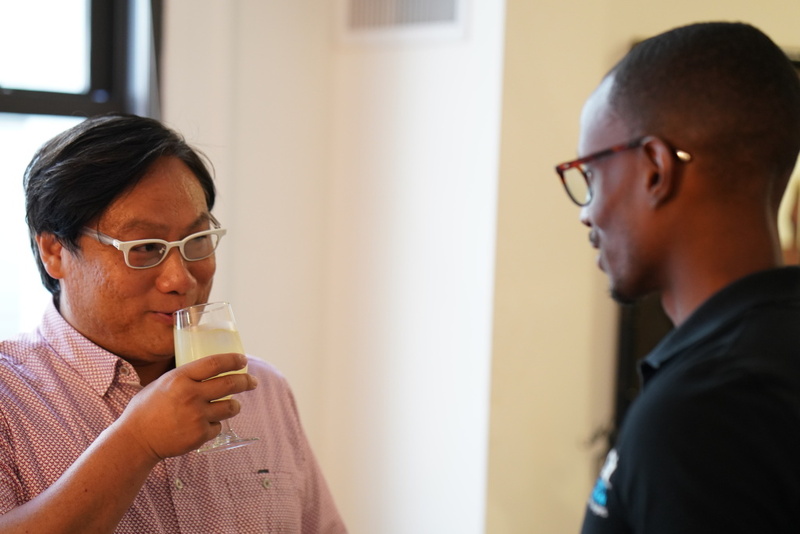 It was one of 100 dinner parties that were taking place this week across all 15 L.A. council districts, catered by local restaurants and paid for by the city. 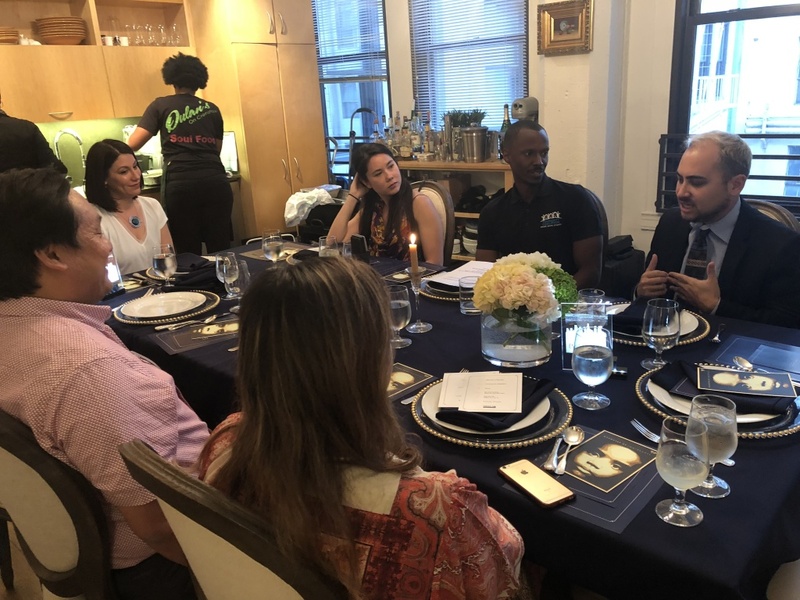 The guests for Tuesday night’s dinner were: Amna Qazi, who is Pakistani and Muslim; Danny Hom, who is half Cantonese, half Ashkenazi and identifies as bi; Tom Chang, who’s Taiwanese American; Emily Coldiron, who’s half white and half Vietnamese; and Ernesto Hidalgo, who’s Latino and grew up in L.A.
Back row, left to right: Veronica Perez, Emily Coldiron, Anthony Foster, Danny Hom. Front row, left to right: Tom Chang, Amna Qazi. The conversation that unfolded over the course of two hours varied from the personal to the abstract. Race came up, but the focal point of the first hour was homelessness. Was Anthony Foster surprised that a dinner meant to focus on race relations turned into an in-depth discussion of homelessness? “It’s important to lift up that we are in downtown L.A., so I think the proximity of the folks that live here may have also contributed to why it was the first thing that came out the gate,” Foster said. He was glad the conversation evolved into a discussion of the intersection of race and homelessness. 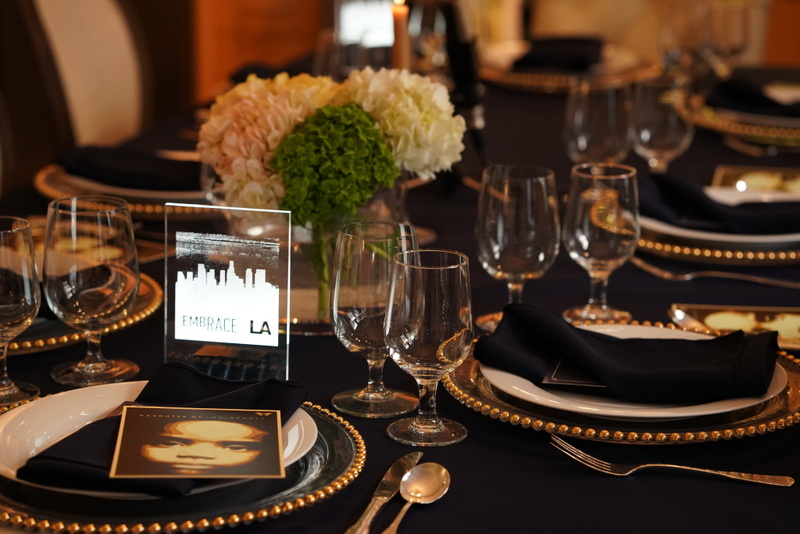 There were 1,000 spots for this embRACE L.A. dinner series. Over 2,000 people signed up. So Herb Wesson says he wants to organize more dinners in the coming weeks for everyone who didn’t get a spot. And after that? “We will be engaging with other cities to try to get them to do this as well,” Wesson said. Be it around race, homelessness or another social issue. The goal, Wesson said, is to have a national conversation. Maybe around a dinner table.